Cyclones are devastating natural events. Damaging winds, torrential rain and huge waves accompany storm surge as the spiral weather system makes landfall. Size and power so out of the ordinary that many man-made structures are flattened, inundated or tossed around like leaves on the breeze. They are low pressures storms fueled by the sun warming the ocean, then by latent heat of condensation where energy is released as moist air rises and water vapour condenses. The size and intensity of these major weather events vary. A classification system puts each event on a scale of 1 to 5 only the scale is not linear but geometric when it comes to their strength and impact on the ground. 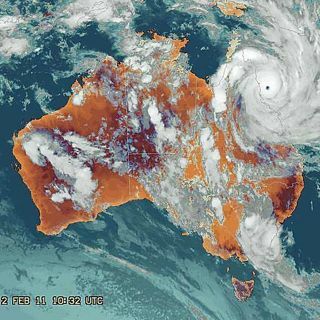 A category 5 event such as Yasi that caused huge distress and damage to towns and settlements in northern Queensland with 285 kph winds was much bigger twice as intense as Larry, a category 4 event that hit a similar area in 2006. This image came from the Australian Bureau of Meteorology radars just before the storm made landfall. Hurricane Katrina in the US was also a category 5, only the combination of making landfall at the site of a large city and higher storm surge caused more infrastructure damage than Yasi. Hurricanes, cyclones and typhoons are the same phenomena. They are given different names in different parts of the world. All the talk in Australia is that the widespread floods and hurricane activity of early 2011 can be linked to global warming . The scientists say that there is greater than average moisture in the atmosphere in the tropical regions to the north of Australia thanks to a strong La Nina weather pattern in the central and eastern Pacific Ocean. And the scientists also say that this pattern will lead to heavy summer rains and an active storm season. The 2010-11 La Nina event is the strongest since 1913. Then, of course, the climate models predict more severe storms and intense hurricane activity when the climate warms. It is a simple and apparently logical step to conclude that the current events in Queensland must be the result of global warming and another small one to assume anthropogenic climate change . But if you listen to the scientists carefully there is a story in how they say what they say. They deliver with confidence that the pressure depth of Yasi was 20 kpa lower than Larry and consequently the winds were stronger at 285 km/h. It is a matter of fact. Why? Because they are sure of the facts but not necessarily the causal links. We cannot blame them for this. It is not possible to collect definitive experimental data on global warming. The scientists will always have to rely on observation, some correlations and their fuzzy-logic models. And with a camera on them they will revert to "possibly". What we do know is that these events occur, have always occurred and will occur into the future. And now we are here to witness and be affected by them.